Rapid fire tweeting isn’t really my thing, especially with the cast it makes tweeting incredibitly awkward. 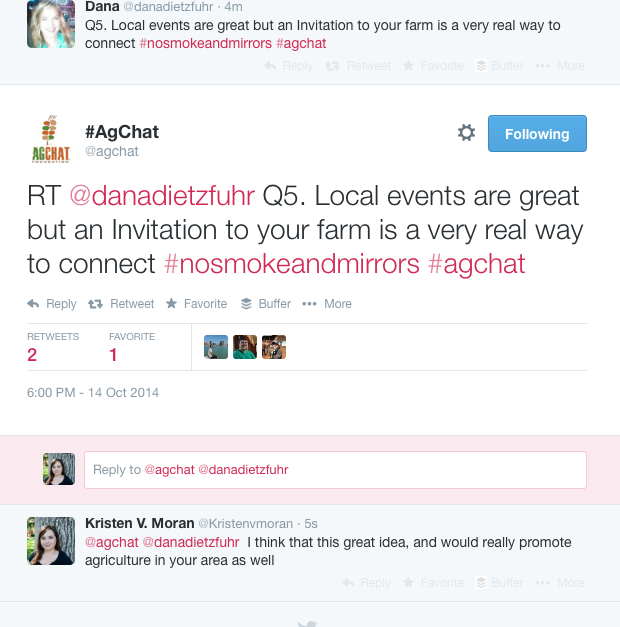 Although none the less I got to interact with pretty awesome agriculture industry leaders via the #agchat last tuesday. The #agchat was centered around one of my favorite topic agriculture & politics. A lot of agriculturists had a great ideas to both educate the public about agriculture and combat current misconceptions. The chat highlighted various ways for agriculturists to become active in the political sphere, it promoted helpful and progressive tips. This is where I decided to but my two cents and share this application which has allowed me to keep up to date on current agriculture policies in the United States, they even have a option to email your local congressman or representative to voice your opinion. Lets be real, agriculture is messy. Politics are even messier, but with this application it gets a little easier.